A ledge is seen at low tide after rockweed was cut by vacuum machine in Cobscook Bay, near Moosehorn National Wildlife Refuge, in August 2012. Maine's highest court on Thursday upheld a lower court decision that property owners can deny cutters permission to harvest the brown alga. Tenants Harbor fisherman and seaweed harvester Hale Miller maneuvers his barge while harvesting rockweed off the Muscle Ridge Islands in July 2016. Maine’s highest court on Thursday ruled that rockweed along the seashore isn’t public property, siding with coastal homeowners in a case that pitted them against businesses and harvesters working in an industry that uses the seaplant to make food, cosmetics and other items. The 22- page opinion issued by the Maine Supreme Judicial Court upheld a 2017 Washington County Superior Court decision that affirmed property owners’ right to deny cutters permission to harvest the brown alga in the intertidal zone between the high- and low-tide boundaries. 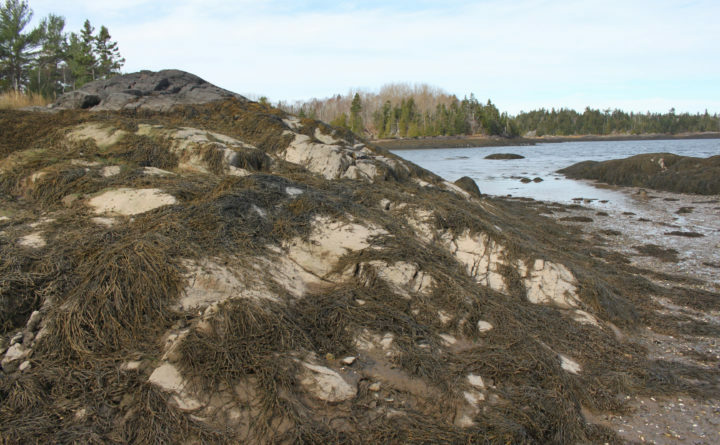 Seaweed harvesters and the state Department of Marine Resources had argued that the practice should be allowed, in keeping with a long-standing precedent dating to colonial times that allows fishing, fowling and navigation in Maine’s intertidal zone, regardless of ownership. “We agree that rockweed in the intertidal zone belongs to the upland property owner and therefore is not public property, is not held in trust by the State for public use, and cannot be harvested by members of the public as a matter of right,” the Law Court wrote in its decision. The debate over who owns rockweed has simmered in the state for years, with coastal property owners, cutters and state regulators attempting to balance competing interests. Oral arguments in the appeal were presented to the Law Court in November 2017, but it took the court more than a year to render a decision in the case. The president of Acadian Seaplants, a Canadian company that appealed the lower court’s decision, said Thursday morning that the ruling was “extremely unfortunate for an entire industry and Maine’s economy.” He said the firm spent more than $1 million in Maine last year on operations, transportation costs and capital investments — most of it in Washington County, where most of its operations are based. The county had the highest unemployment rate in Maine in February and has the state’s highest poverty rate. “The sustainable harvesting of rockweed has created jobs and grown businesses, all of which are creating sustainable and environmentally friendly products,” Jean-Paul Deveau said. According to DMR statistics, the value of Maine’s annual rockweed harvest has grown nearly tenfold since 2001, when the industry’s gross revenues in the state amounted to $84,000. The value of the statewide harvest in 2018 was $820,000. Gordon Smith, who represented brothers Kenneth and Carl Ross and the Roque Island Gardner Homestead Corp. in their lawsuit against Acadian Seaplants, said his clients are “thrilled” with the ruling. “They are conservationists, and they are happy the resource will be protected,” Smith said. Smith said the case touches upon an issue that has long been debated in Maine — what kind of public access is allowed in the intertidal zone — but that the more narrow question that this case addressed is whether harvesting rockweed can fit under the “fishing, fowling and navigation” provision of state law. Rockweed is a plant, he said, and as such is not subject to the same allowances for harvesting in the intertidal zone that apply to marine creatures and birds. “On that level, it’s a pretty straightforward case,” Smith said. 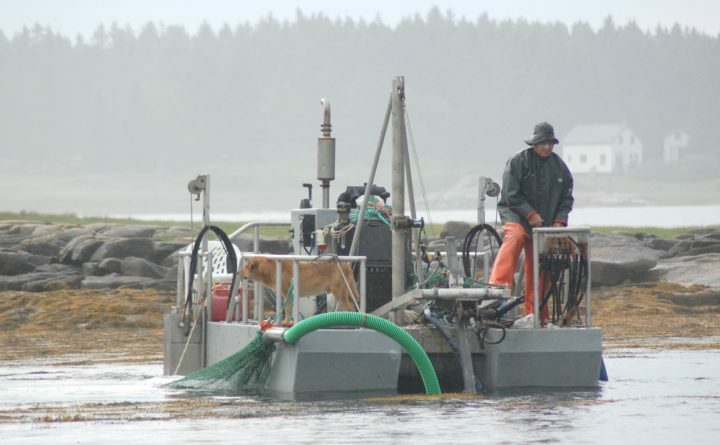 He does not think the ruling will have a significant impact on rockweed harvesting in Maine, because there have been few conflicts between rockweed harvesters and shorefront property owners. “In most cases, the harvesters have honored those requests [not to cut on someone’s property], even before this decision came out,” Smith said. Jeff Nichols, spokesman for DMR, said in a brief statement that the department has been notified of the decision and is reviewing it to determine what if any change in state law and/or regulation might be required. “In the meantime, we will be reaching out to [seaweed firms and harvesters] to indicate that any seaweed harvesting activity in the intertidal must be done with appropriate permissions from landowners whose deed includes the intertidal zone,” Nichols said. Hale Miller, a rockweed harvester from Tenants Harbor, said the decision represents “a real sad day for the people of this state.” He said it favors wealthy shorefront property owners over other Mainers. And it could have repercussions for others who earn a living in the intertidal zone, whether they are fishermen or kayak guides, Miller added. It likely will make it more difficult for people who harvest other marine organisms such as worms, clams or periwinkles. Miller added that the Legislature could change state law to permit rockweed harvesting in the intertidal zone, but he doubts that its members fully grasp the issue. “I really didn’t believe this decision was going to go the way it went,” Miller said. Acadian will continue to maintain its operations in Maine despite the law court’s decision, Deveau said, but with the Law Court ruling harvesters now will be expected to get permission from shorefront property owners before they can collect rockweed from the intertidal zone in front of the owners’ property. The company employs five full-time workers, up to 30 seasonal harvesters and two year-round mechanical harvesters.